After gathering the facts and crunching the numbers — using nothing less than the Bush Administration's estimates — AOPA has launched its effort to spread the facts about the FAA's funding "crisis" and combat the fiction that is being propagated by the FAA and the airlines. 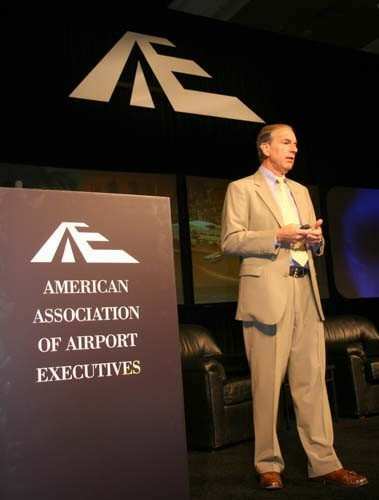 AOPA President Phil Boyer started the push on Wednesday in San Diego with the American Association of Airport Executives (AAAE), a professional organization for airport executives that represents management ranging from small GA airports to large commercial airports. 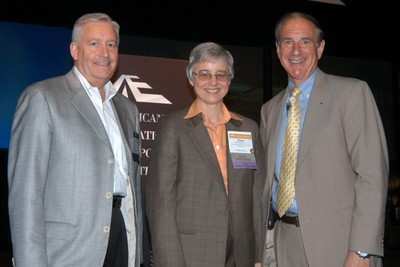 More than 500 executives were on hand for Boyer's address during their annual conference. "Looming on the horizon for aviation is the threat of user fees," being fueled by the expiration of the current funding mechanism of excise taxes for the FAA budget. "What is the problem we are trying to solve?" That is the fundamental question in the FAA funding issue, Boyer told the group. Each party to this debate has a separate answer. The FAA wants to reduce congressional control; the Bush Administration wants to cut funding; the airlines want control; the airline passengers want good service; and Congress just wants to make it through the year. So who's really trying to figure out what's best for the pilots who use the National Airspace System? That's where AOPA comes in — with the facts. Contrary to those who say the system is going broke, by AOPA's most conservative view, and using White House budget office estimates, the aviation trust fund could have a $4.2 billion surplus by 2011. And by AOPA's most liberal estimates, it could reach $9.3 billion by that time. As for the airlines' claim that the aviation trust fund would shrink because ticket prices are declining...that's fiction as well. Boyer showed the airport executives articles from BostonHerald.com, CNN.com, and USA Today that show ticket prices are up. In fact, CNN.com cited the Air Transport Association (ATA) — the AOPA of the airline industry — on the issue in an April 12 article, "The ATA says prices are up more than 10 percent year-over-year." Aviation finance expert Daryl Jenkins even says they are up: "Today's economic climate is allowing airlines to raise fares, which means — especially when passengers are flying — that revenue from the existing ticket tax will increase. During the last 12 calendar months, there [were] more than 30 attempts by the airlines to raise fares, and at least 17 were 'successful.'" The airlines say they have a solution to this "funding crisis" — all Congress has to do is listen to them. According to the ATA, "Congress must determine and impose a specific schedule of mandatory user charges — directly and proportionately linking the system costs...."
"The airline industry has proven in recent years they can't run their own businesses — so why are they telling Congress what it must do?" Boyer asked. "Congress must remain as the 'board of directors.'" FAA Administrator Marion Blakey, in an attempt to sell a changed funding pattern, has been stating that the United States was one of only a couple dozen countries in the world that did not charge for the actual cost of ATC services. But, as Boyer pointed out, that's a good thing. "It's the safest, most efficient in the world, and the national economy benefits from our leadership in aviation," Boyer said. "Just look at the facts: In 2005, the United States had nine times more departures than United Kingdom and four times more airports than Brazil. And general aviation is a large part of the U.S. aviation industry. In 2004, 68 percent of all aircraft in the country were GA."
The U.S. ATC system — created specifically for the airlines — is also the world leader when it comes to cost effectiveness. 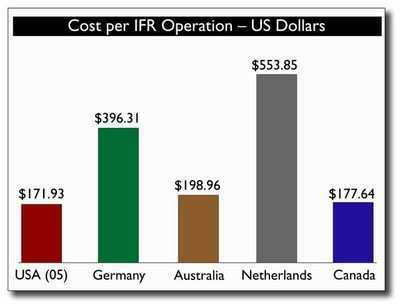 In 2005, the United States had the lowest cost per IFR operation — only $171.93. Now compare that to Germany, a country that is the size of Montana: $396.31, and the Netherlands, which is two times the size of New Jersey: $553.85. Boyer pointed out that we must also look at ways to reduce costs of operating the air traffic system, prior to calling on Congress to change the funding system. Projects that are already under way, like the modernization of flight service stations and the elimination of unnecessary or redundant navigation aids, are perfect examples of cutting costs and modernizing the ATC system at the same time. Improvements in technology also can reduce costs. An effort already is in progress to replace today's costly radar system with an automatic dependent surveillance-broadcast (ADS-B) system that provides more reliable, complete coverage for pilots and air traffic controllers. "There is a lot of misinformation going around," Boyer said. "But the facts speak for themselves: There will be a trust fund surplus by 2011; modernization is an enabler for reducing ATC system costs; airline ticket prices are rising; and the current ATC system is the safest, most efficient system in the world. "Let's keep Congress serving as the 'board of directors' and keep our National Airspace System the leader of the pack."